The Freelance History Writer once again welcomes Michael Long. He is a freelance author and historian and has written many articles on medieval and Tudor history mostly in the UK. He has spent more than thirty years teaching history and is presently writing a novel based on the exploits of Willikin of the Weald. In the story of English history, across the centuries, there are first-born sons destined to be Kings of England who never were. It is widely held that when it came to inheritance the unwritten ‘rule’ was, heir and spare as so often, the eldest born male child pre-deceased the King leaving the throne to pass to his brother. Had the eldest son lived the events that shaped out the past may have played out quite differently to the history we know perhaps even with this article being written in French. This is the story of four of them. 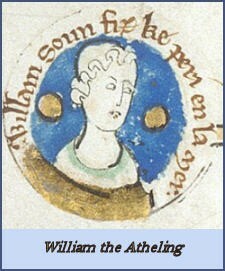 From an early age, Henry’s son William Adelin (old English for, ‘of noble birth’) was groomed for kingship. It was expected that he would inherit his father’s crown and even the fickle Anglo-Norman Barons swore him loyalty in 1116, and he was given the title ‘Rex Designatus’ (King designate) two years later when his father was campaigning in Normandy, acting as regent in his absence. No description of William Adelin survives; it is known that he fought alongside his father in battle and acquitted himself well. His language would have been French, not English, for the latter was the language of the Saxons. English Saxons would have perceived him favourably and as not wholly Norman, however, as his mother was a direct descendant of Aethelred the Unready. 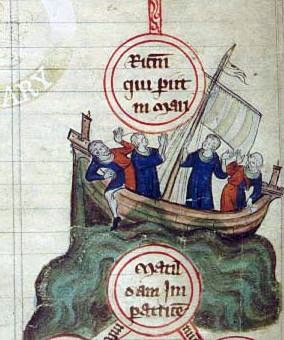 In November 1120, William was en route to England from the French port of Barfleur on a new vessel called the White Ship, when it struck submerged rocks, the Quillebœuf, a mile outside the harbour. Although he survived the sinking by scrambling into a small boat, William was drowned trying to save his half-sister. The death of William left King Henry desolate and with one surviving legitimate heir, his daughter Matilda who he named as his successor. Upon his death in 1135 the Anglo-Norman Barons were reluctant to accept Matilda as Queen and supported her cousin Stephen of Blois instead thus prompting a disastrous period history calls ‘the Anarchy’ which lasted until 1153. Had he not drowned with the White Ship he would have become King William III on the death of his father in 1135 and the divisive civil war between Matilda and Stephen would not have occurred. If he had a male child, the Crown would not then have passed to the Plantagenet line founded by Henry II. Other threads in English history would have woven differently. Because Henry II would not have become King, the Angevin-Plantagenet empire in France would not have come into being; Thomas Becket would not have risen to prominence to become Archbishop of Canterbury; there would have been no murder in the cathedral; no pilgrimages to his shrine; no Chaucer and no Canterbury Tales. In June 1170, the fifteen-year-old Henry Fitzhenry, the first son of King Henry II and Eleanor of Aquitaine to survive infancy, was crowned king of England during his father’s lifetime. Yet even he was not born to inherit. His elder brother, Prince William, died at the age of three making the infant Henry heir. A married ‘man’ at the age of five to his two-year-old bride, Henry’s marriage was hasty even for the time. His coronation ceremony at Westminster Abbey was conducted by the Archbishop of York usurping the prerogative of the Archbishop of Canterbury, Thomas Becket and further exacerbating the dispute between him and the King, which would culminate with Becket’s murder at Canterbury six months later. In 1182 he fell out with his mentor, William Marshall accusing him of an affair with his wife Margaret and later that year he went to war against his younger brother Richard over the province of Poitou. King Henry supported his second son Richard in this conflict, funding his campaign. In June 1183 the ‘young king’ was pillaging French monasteries and convents to pay for his mercenary army when he contracted dysentery. Near to death, he asked to be reconciled with his father, the King, but Henry II, on receiving the request feared a trap and refused to see him. He died on 11th June aged 28, and his tomb lies in Rouen Cathedral at the opposite side from where the heart of his younger brother Richard is buried. 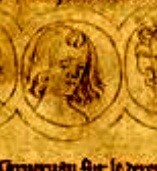 Arthur was born in March 1187 in Nantes, the grandson of King Henry II and Eleanor of Aquitaine. 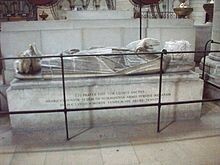 His father Geoffrey was Duke of Brittany, Henry and Eleanor’s second surviving son after King Richard. Having no children from his marriage to Berengaria of Navarre, Richard named the young Arthur as heir to the English throne in his will before embarking on the Third Crusade in 1190. Arthur had inherited his father’s Dukedom and spent his years in Brittany. Before his death from gangrene poisoning at the Siege of Chaluz, near Limoges, in 1199, King Richard changed his mind and expressed his wish that his youngest brother Prince John inherit the English Crown. Why did he do this? Perhaps because Arthur was just 12 years old and too young to rule and moreover, was under the influence of the French King Phillip II. On hearing news of his brother’s death, John rode to secure the English fortress at Chinon high above the Vienne River, where the royal treasury was kept. The Anglo-Norman Barons with lands in both countries declared their allegiance to Arthur as the rightful King, but John, who returned to England with the royal wealth, had the backing of his mother, the powerful Eleanor of Aquitaine. The influential, William Marshall, considered the premier lord in England backed John’s claim also. For three years a bitter war raged in western France between supporters of the two sides. 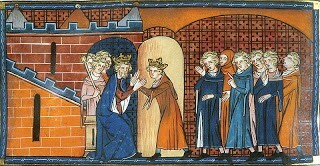 In July 1202 Arthur besieged his grandmother, Eleanor of Aquitaine in her castle at Mirabeau. She succeeded in sending word to John, who rode 80 miles in two days and captured Arthur outside the fortress. He was imprisoned firstly at Falaise and then at Rouen. His gaoler was Hubert deBurgh who was ordered by King John to blind and castrate Arthur, but de Burgh could not carry out the instruction and kept Arthur safe while telling John that his instructions had been carried out. When the news spread that Arthur had been killed, there was outrage towards John, which prompted de Burgh to confess the truth. Arthur was paraded in public to show he was still alive. Sometime after Easter 1203 Arthur disappears from history. Later chroniclers allege John himself killed Arthur with a dagger, weighed his body down with stones and dumped it in the River Seine where it was later found by fishermen and buried in secret. Long before the mystery of Richard III and the Princes in the Tower, another prince disappeared into the mists of history. The truth will probably never be known, but such stories contributed to the dark legend that was King John. In the years that followed, John emptied the English treasury to finance his disastrous campaign which culminated in his losing Normandy and his rendezvous with destiny at Runnymede in 1215. Would King Arthur have changed the course of our past? He swore allegiance to King Phillip of France, so it is likely that under his kingship Normandy would have become French. Thus he in all probability would not have fought a prolonged war against France and not levied the punitive taxes so resented by the English barons. Because they were not ‘hit’ where it hurt them most, they may have remained loyal to him and not rebelled, meaning there would have been no peace settlement between King and barons in 1215, known to history as Magna Carta. Nor would there have been the French invasion and occupation of England in 1216 by the Dauphin Prince Louis. Arthur may have had an heir, but that son would have been another Plantagenet. Had he been king, the court and the law would have remained firmly French (he spoke no English). 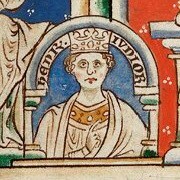 Had he died childless, then the logical choice as the new King would have been John’s son Henry, who himself inherited the Crown in 1216 aged just nine as King Henry III. This is not fantasy; there really was an English Prince Alfonso. He was the third son of King Edward I and was born in November 1273 in Bayonne in Gascony. His two elder brothers died in infancy leaving Alfonso as heir to the English throne. He was named after his mother’s uncle, Alfonso X of Castile and was given the royal title, Earl of Chester. In 1283 he was betrothed to the daughter of the Count of Holland and arrangements were being made for the marriage when he died unexpectedly in Windsor in August 1284. During his life he was groomed for Kingship and following his death, it was his younger brother Edward who became the heir, eventually succeeding as Edward II in July 1307. Alfonso was buried in Westminster Abbey in the Chapel of Edward the Confessor, but the precise location has been lost. It is impossible to speculate how a reign of King Alfonso would have differed from that of Edward II. When Edward I died in 1307, Edward II inherited his father’s Scottish war and huge royal debts. He had favourites including Piers Gaveston and the Despenser family and alienated the English nobility culminating in rebellion. The disastrous Battle of Bannockburn blighted his reign, and he was forced to accept the Ordinances of 1311 which limited a King’s right to go to war without the agreement of Parliament and giving them control over royal administration. His wife had a scandalous affair with the Earl of March Roger Mortimer and ultimately Edward was forced to abdicate in favour of his eldest son Edward III. Would King Alfonso have carved a similar path? He would have inherited the same Scottish war and debts Edward did. He would have faced unrest in Scotland that may have resulted in a Bannockburn. Would he have promoted favourites and alienated the barons? So cataclysmic was the reign of Edward II that it is impossible to speculate.